This was inspired by an outfit that I wore a few weeks ago (this design was also done a few weeks ago). 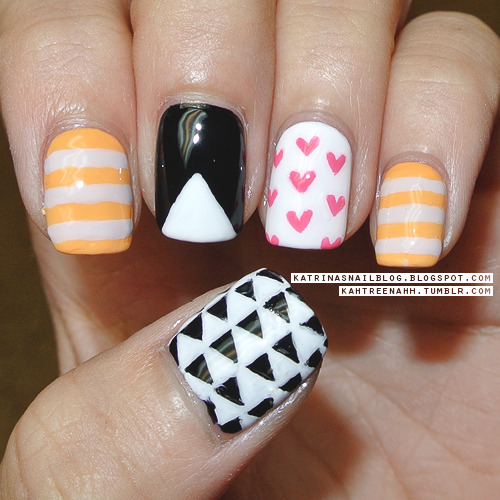 Let me just say that those triangles on the thumb took foreverrrrrr to do! o__O The mustard yellow is Etude House's OR205 Tangerine Sherbert, the ivory-ish stripes are done with Orly's Pure Porcelain, and the pink hearts were painted on with China Glaze's Laced Up. So cute! You must have a very steady hand. thank you Robyn, my hand is only kinda steady ... haha.